This is a clone of Asteroids from a Spanish budget developer. Classic gameplay - we move around a limited section of outer space on a ship with a top view, and asteroids and, less often, other opponents, as well as bonuses fly in from all sides. The latter can be knocked out of cobblestones or delivered by a friendly comet. If you want to increase your firepower, restore your health, get an extra life or bonus in the piggy bank of points, then you need to try to pick them up. As for other enemies, among them an alien ship and a mine-like mine disco, a collision with which leads to instantaneous death. 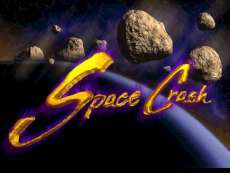 It is noteworthy that a few months later in the same 1998, Space Crash will be one of the levels of another game from NewSoft, Feroze . And separately, it produces much better impressions: yes, management here is also not the most obedient, but the colorful palette and dynamics of what is happening are pleasing. But the main value of this game lies in its incredible rarity.